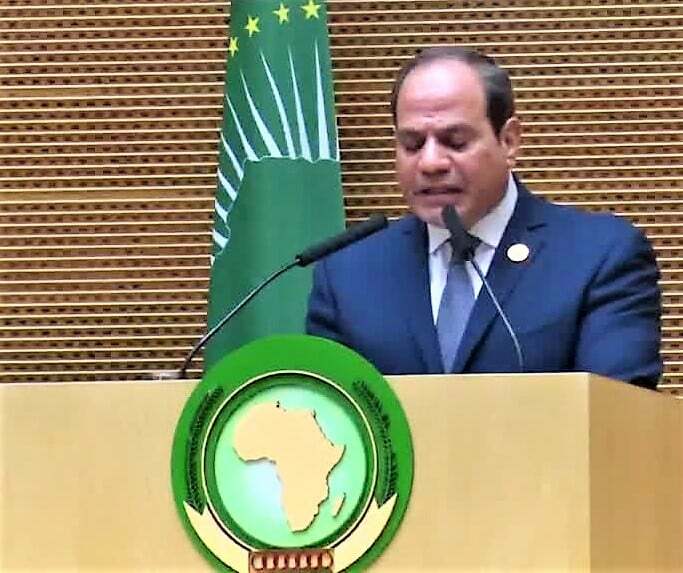 The President El-Sisi in a historic speech from the platform of the African Union said “Our ancestors possessed the wisdom of unity, and from them we draw courage and must be based voluntarily and enthusiastically on the rock of African solidarity”. Egypt has officially received the presidency of the African Union (AU), for one year. Once the president’s name was announced inside the Nelson Mandela Hall at the African Union headquarters in Addis Ababa, this was greeted with warm applause from the participating delegations. Integration and development of the continent. For his part, President Abdel Fattah Saeed Hussein Khalil El-Sisi stressed the importance of establishing the principle of “African solutions to African problems”, which is the only way to deal with the common challenges facing us. In his speech after assuming the presidency of the African Union, El-Sisi added that Africa is better able to understand the complexities of its problems and the specificity of its situation and thus be able to find serious and realistic solutions and remedies that will realize the interests of its people and protect them from outside interference and falling into the clutches of innovative and contemporary patterns of exploitation. Fit their reality. El-Sisi expressed his sincere congratulations to President Cyril Ramaphosa, President of the Republic of South Africa, on his election to the presidency of the African Union in 2020. “I believe that our cooperation as the President of the Union will support continuity and institutionalization in the common African framework, I also welcome the African leaders who are presiding over the delegations of their countries for the first time to the African Union summit meetings, congratulating them on the confidence of their peoples and wishing them success in their missions and looking forward to cooperating with them to promote joint African action. The President also thanked the Majesties, Excellencies and Excellencies for the high honor and trust they gave to Egypt to lead the African Union in 2019, which represents the summit of the joint African action, which was exemplified in the national liberation revolutions in Africa since the 1950s. The political struggle against colonialism was the main focus of its foreign policy at that time. Cairo was a main destination for all African movements seeking independence and national liberation from colonialism. El-Sisi continued: “I stand before you today, aware of the great responsibility you have entrusted to Egypt to coordinate the joint African action in a delicate international and continental situation, which is plagued by extremism and the waves of terrorism. The challenges facing the concept of a national state are increasing, the people, and there is no cause for optimism, such as our meeting together to deliberate and deliberation in the affairs of our glorious continent, and coordinate our steps on the path of one march in order to delight hundreds of millions of our children and grandchildren, the goal to which we devote all our work and effort. He said that more than half a century has passed since the meeting of the founding fathers who laid the foundation of the African unity here in Addis Ababa in May 1963, when the late leader Gamal Abdel Nasser said, “Let it be a charter for all Africa, and hold meetings at all official and popular levels. African common market, “words more than half a century old but still resonating. He added that since that historic moment so far, Africa has come a long way, and we have been able to achieve many dreams, overcome many obstacles and faced new challenges, we have rid ourselves of colonialism, although its effects and sediments remain, and we are working hard to consolidate the elements of peace, security and stability , And the economic integration and continental integration of our countries and peoples, in an effort to build African people, as it has been proved beyond any doubt that the common understanding and mutual respect among us is the greatest driving force we give to the African Union and that by deepening our United “We are divided in two ways,” said the late Ghanaian leader Kwame Nkrumah. “In our union, Africa can become one of the greatest powers in the world. President al-Sisi pointed out that despite our efforts to control and block conflicts in the continent and our ambitious plan to silence guns throughout the continent by 2020, it is no secret that there is still a long way to go to end the fighting in Africa. The painful history of conflicts in Africa, which have won the hopes of development on the continent. He stressed that we must believe in the need to fortify the development shield to address the root causes of the crises. Therefore, I urge you, the leaders of Africa, to work together to revitalize and implement our post-conflict framework policy for post-conflict reconstruction and development and to develop executive action plans to protect countries emerging from conflict against relapse notification, and helps to build the capacity of state institutions to carry out their tasks in the protection of their countries, and contribute to healing the wounds of our societies. We look forward to launching the activities of the African Union Center for Post-Conflict Reconstruction and Development, hosted by Cairo, as soon as possible as a pan-Arab coordination platform and think tank that is developing specialized programs for post-conflict countries that take into account the country’s specificity and protect its right to ownership of the reconstruction process and development. The mediation and preventive diplomacy will remain a top priority for the African Union, and we will work to strengthen coordination and harmonization of regional and regional peace and security mechanisms, to complement without intersection, thereby enhancing early response. And effective for various crises. He said that terrorism remains a malignant cancer that seeks to infiltrate the bodies of African nations, attacks the joints of the national state and hijacks the dreams of peoples and their children. Combating terrorism comprehensively requires us to identify its supporters and sponsors, and confront them together in a collective and revealing framework. Is the best way to uproot and eliminate the root causes of terrorism. This does not diminish the inevitability of refuting the poison of extremism that produces terrorism and the need to strengthen the strong and strong national institutions of the state. El-Sisi explained that bridging the gap between establishing peace and stability and making peoples the fruits of development is the top concern of the international peace and security forums, and is concerned with the political leadership and the brightest diplomatic, security and strategic minds. In this context I am pleased to announce the launch of the first edition of the Aswan Forum for Peace and Sustainable Development To be a regional and continental platform where political, intellectual, peace and development leaders and development partners will meet in Aswan, the jewel of the Nile, to discuss together the prospects of linking peace and development in a sustainable manner, making a tangible difference in the lives of people. The spread of conflicts, the brutality of terrorism, the barbarity of extremism, climate change, the severity of poverty, water scarcity and drought are all factors that combine to drive people to leave their homes. The effects of these crises are primarily on Africa. The number of refugees reaches about 8 million refugees, 90% of whom are refugees within the continent, and the number of displaced people reaches 18 million. This calls for adopting a development approach that includes large regional and regional projects to provide the greatest employment opportunities for the continent’s citizens. Enlightened and re-awakened Communities and create conditions for the return of displaced persons to their homes, as well as the establishment of a medium-term development plan to create an integrated and attractive economic zone across the continent to employ manpower and African minds and keep them in the arms of the mother continent. He stressed that in the same context, we should intensify our scientific cooperation to benefit from the natural resources of the continent in diversifying energy sources by supporting renewable and clean energy projects, thus contributing to alleviating the environmental impacts of the climate change we are witnessing and affecting the lives of our peoples. Our planet, in accordance with the Paris Climate Accord, calls upon the developed world countries to honor their commitments, especially as these countries have the most influence on the Earth’s climate and benefit most from their resources. Africa has been able to achieve many gains by adopting common and unified positions in international multilateral discussions and negotiations, which prompts us to consolidate African consensus to defend African interests, particularly with regard to the inherent right of the State to own development programs, Africa’s historic right to fair representation In the UN Security Council, reflecting the unified African position in accordance with the Isoline consensus and the Sirte Declaration. “Day after day, great African women regain their pivotal role in contributing to the leadership of our continent, and to them greetings of appreciation and pride for what they have endured and are still facing the woes of war with patience and overcoming the scarcity of resources. There is nothing to prevent you from achieving your hopes and establishing your leadership. Only you can continue the effort, work and armament with knowledge and will. We must open all doors to realizing the hopes and dreams of African women. To the youth of Africa, the heart of the vibrant continent and its youthful arms, I say that we are making efforts and making plans, hoping that we will leave a continent stronger than we have inherited, open wider horizons and find tools that will enable you to lead the safe and secure continent of Africa. And be assured that we always believe in you and your dreams, and keep you hard work, your poverty needs your arms and struggle, and plant your land bright branches of tomorrow before you rush in the adventures of migration closer to suicide, and wait before the drift behind the fabrication’s extremism fall into the trap of terrorism. To Africa’s partners in the world, the President stressed that partnership with Africa is a real opportunity to achieve common interests and to invest an economic and developmental gain. We will endeavor to deepen cooperation with the current partners of the continent to adopt viable operational plans for the peoples of the continent with tangible results. We will also expand the horizons of African cooperation with various international partners, aiming at African capacity-building, knowledge transfer, Modernization of the continental manufacturing system, the development of infrastructure and technology, and the establishment of the digital economy in Africa. Africa is inviting international private sector institutions and international multinationals to invest in our continent. Africa’s markets are open, investment conditions are ripe, our hands are stretched out for cooperation, our land is rich in opportunities and wealth, we have human wealth and our determination to build the future of our continent in various fields is relentless. “I call upon the international, continental and regional financial institutions to play their role in the financing of development in Africa and to provide financial guarantees to build the capacity of the continent so as to promote trade and increase investment, and always remind them that each continent has its own characteristics. The time has come for these institutions to think differently about Africa and to provide flexible conditions and standards that contribute to African countries’ dreams of catching up with progress, modernization and sustainable development”. He stressed that our success in achieving the goals of economic and social development depends to a large extent on our ability to meet this challenge in one hand, and therefore we must work together to overcome the obstacles facing the deepening of the joint African action by focusing on three axes. The first is to promote efforts to achieve regional integration in Africa. The best way to do this is to develop African infrastructure by maximizing cross-border projects and encouraging investment in this area, particularly within the framework of projects within the priorities of the African Union such as the Cairo- Between the north and south, and linking the Mediterranean Sea with Lake Victoria. The second is to push forward continental integration by accelerating the establishment of the Africa-Africa Free Trade Area, which is one of the most important priorities of the African Union, which contributes to the reduction of the prices of many commodities and increases the competitiveness of the African continent on a global level. We must work together to complete the African trade, investment and economic system so that we can achieve realistic results that our peoples are aware of. The third and last axis is the culmination of the two previous axes: seeking more employment opportunities for young people, which requires mainly to mobilize national and international investment, attract capital and localize technology. The President said that the continent’s eyes are looking forward to us and await our decisions and actions with all due attention. We have no choice but to accept the challenge and to prove that the people of this struggling land are able to continue to strive for a better world for our African peoples. In the light of an international situation full of challenges and difficulties that countries will not be able to confront individually. Hence the importance of translating our words and decisions into specific practical steps, so that the outside world is assured that we mean what we say and that African solidarity is an effective entity that can move attitudes and impose Ssh on events, not just a slogan in theory. He added that our ancestors possessed the wisdom of unity, and we draw courage, the courage of the late leader Nelson Mandela, who was named after him, “It is not the absence of fear but the ability to overcome it.” We have to renew the covenant to complete that the march with unswerving determination and unflagging inspiration to rely voluntarily and enthusiastically on the rock of African solidarity, which has long promoted the faith of the peoples of the continent that their interdependence is the only way to safeguard their rights and interests. On the other hand, President El-Sisi participated on Sunday morning in Addis Ababa in a trilateral summit with Sudanese President Omar al-Bashir and Ethiopian Prime Minister Abiy Ahmed. This is an extension of the meetings that took place between the leaders of the three countries since the African Summit in January 2018. The aim is, provide a political umbrella to support the technical negotiations on Al-Nahda Dam, overcome any obstacles in this regard, and work to strengthen tripartite cooperation between Egypt, Sudan and Ethiopia. Ambassador Bassam Rady, official spokesman for the presidency said that the president stressed in this regard the importance of working to ensure a balanced and cooperative vision to fill and operate Al-Nahda Dam to achieve the interests and objectives of each of the three countries. Leaders of the three countries stressed at the summit the need to share a single vision on the issue of the dam, based on the Declaration of Principles signed in Khartoum, and to uphold the principle of not harming the interests of the three countries under the common benefit. The tripartite summit also touched upon the overall dimensions of the relations between the three countries and means of enhancing cooperation between them, while continuing intensive consultation and coordination on various issues of common interest.